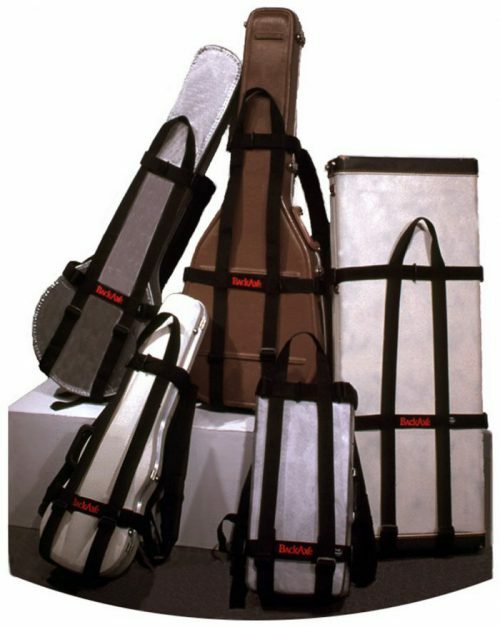 The simple, revolutionary way to comfortably and easily carry your instrument, in the protection of its hard-shell case, with the convenience of a backpack. It quickly and easily adjusts to fit you and your case. Our original guitar BackAxe, adjusts to fit any size or shape acoustic or electric guitar case–square or contoured. 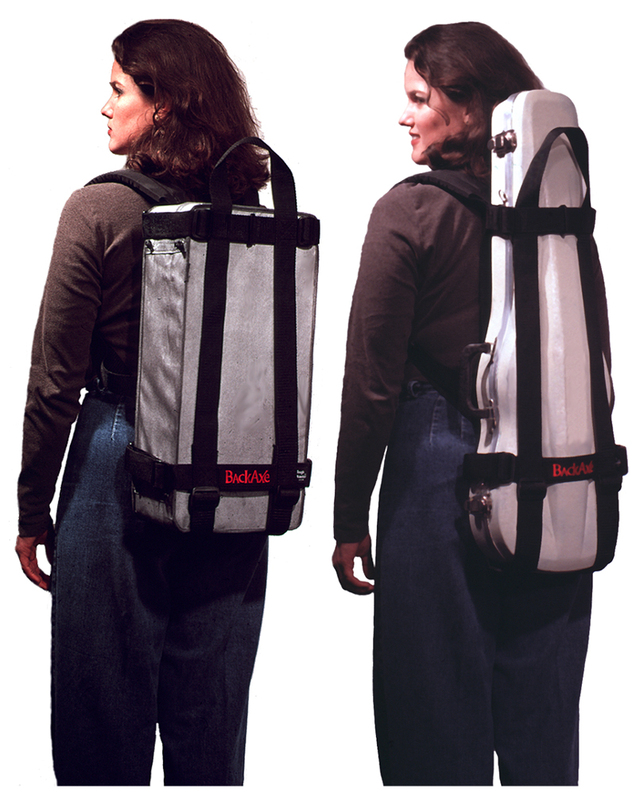 It allows you to carry your instrument protected in its hard-shell case with the convenience of a backpack. 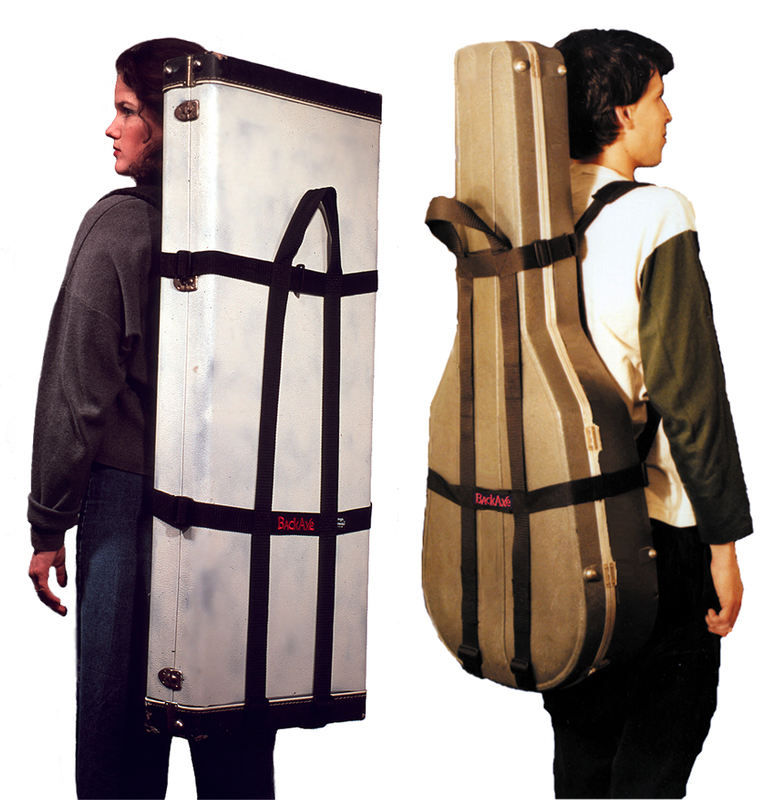 It will also adjust to fit a banjo, electric bass and many other cases of similar size. Once adjusted you simply flip it over your case and close the 2 side-release buckles to get it on. You’ll use it any time you carry your axe anywhere. It’s adjustable and fits many small cases from about 2 ft to about 3.5 ft in length and from about 18 in. to about 48 in. around (circumference). It fits many cases, contoured and square, including but certainly not limited to; violins, violas, mandolins, dulcimers, trupmets, saxophones (alto and tenor), autoharps, banjos, and Baby Taylors. Will it fit my _________? E-mail your case dimensions and we’ll let you know. After these initial sizing adjustments are made, it’s just the 2 buckles to get it on and off. Now you’re ready to carry your case on your back — comfortably, easily, anywhere! You can use your credit card and order directly from us. It’s easy, quick and secure. We use PayPal to process your payment. You do not need a PayPal account to pay with a credit card. If you have an account you can certainly use it. We’re sorry, but our on-line ordering is temporarily out service. We’re currently out of stock on our small model BackAxe. We apologize for the inconvenience. You can Contact Us if interested and we’ll let you know when we’ll have more. If you’d like to order more than 1 BackAxe, Contact Us and let us know how many of each model you’d like and where you’d like them shipped. We’ll e-mail a customized order form which you can use to complete your order and pay on-line. If you can get a BackAxe through your local music store, supporting local business is a good thing. We always welcome wholesale/dealer inquiries, call or e-mail for information. I’ve been playing guitar for a long time, which means I’ve been lugging them for a long time. The idea of an ultimate instrument carrier had been kicking around in my head for several years. I have many guitars and regularly take them many places. 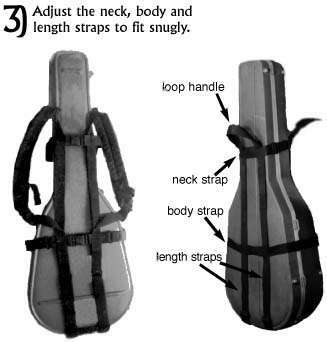 I’ve never been one for gig bags since I’m always putting guitars in trunks, on planes, etc., And I remember my cousin snapping the neck off his custom-built electric when the shoulder straps on its gig bag gave way. I was in Manhattan for a computer-geek trade show and a rehearsal/jam with some friends. I left the show at the Javits Center, walked and subway-ed to the East Village where we were playing, played, and went back. I had a luggage shoulder strap attached to my case handle with a carribeaner. This effectively meant that my fairly heavy solid body electric hung off my shoulder for about 5 hours and many miles, by guitar strap and luggage strap. It was while walking across town on the way back I decided I must concoct a better way–some sort of back pack rig. Shortly after I got back home I pondered and designed the first version of what was to become the BackAxe. I hunted down the necessary materials, and thanks to Mom’s sewing machine, skill, humor plus pizza and beer, we built the first prototype. It was the most convoluted, complicated, contraption ever conceived. From several generations of refinement came BackAxe. When I realized how cool it was and showed some friends, it became apparent that I could not keep such a device for myself–I MUST LIBERATE MY FELLOW GUITAR PLAYING AND CARRYING BROTHERS AND SISTERS! So I decided to start a little venture to manufacture and distribute my new invention. I am proud to offer the BackAxe to all. This of course required overcoming a whole slew of dilemmas and headaches including all the production, a patent, a web site, lots of business stuff, etc. If you ever carry any guitar you’ll love a BackAxe. If you’d like to contact BackAxe for any reason — info, ordering, questions, locate a dealer, etc. How'd you find or hear about BackAxe?